I compare creative cooking to painting. If you give a blank canvas and paint to a few different people, the end result is certainly going to look different for everyone. The same applies to cooking; all of us at the culinary school would start with the same ingredients, but the final dishes we all came up with reflected who we were as individuals. Towards the end of the program, we could tell who had cooked what just by looking at the plate! Isn’t it beautiful that we all get to express ourselves in a creative way everyday, and put ourselves on a plate? All cooks are like kids with crayons! Traditional Indian food is all about bold flavors! Going into the culinary school, I almost felt like I had a dual personality disorder. The Indian cook in me kept drifting towards different spices, while the classical french cook I was at the culinary school was more about subtle, refined flavor profiles. For the longest time, I didn’t let these two chefs come close, let alone talk! When I finally let the boundaries between these two cuisines blur, I was amazed at the response I received from my instructors and my fellow trainees at the culinary school! They actually appreciated the little twists I put on classical French dishes, inspired by my Indian roots. Need a little sweetness? How about a pinch of cardamom. How about a little bit of cumin in the mashed potato gravy? My biggest hit was when I used cinnamon, cloves and cardamom with beef bourguignon. I knew my Indian palette was going to love that spice combination, but when everyone else liked the dish, I knew that I was onto something! I think that was the dish that made me decide that my Indian roots and the classical French training can be happily married! So while cooking from recipes is the rage nowadays, in my opinion, the best dishes are the ones which reflect who you are as an individual. Dig deep into your memories, think about the ingredients and tastes that have talked to you in the past, and then let your creative juices flow! I have been drawn to healthy ingredients with an Indian touch in my dishes reflecting my Indian roots. 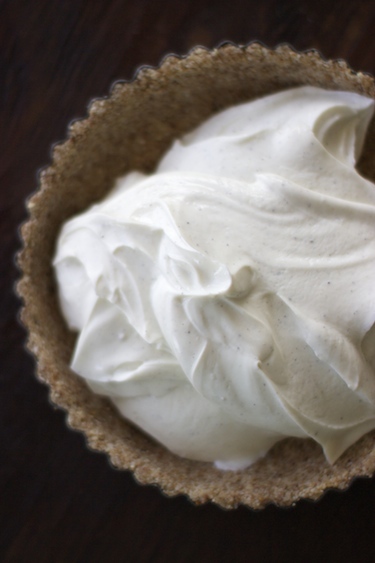 Today I have prepared a Tart with strained greek yogurt. While regular yogurt can be part of a healthy diet, the greek yogurt does have an undeniable edge over the regular kind. Greek yogurt is strained to remove much of the lactose, sugar and liquid whey. This gives it a thick consistency. In the same amount of calories, greek yogurt can pack up to double the protein, while cutting sugar content by half compared to the regular yogurt. I have strained the greek yogurt further overnight, which gave it the creamy consistency of cream cheese. I have added cardamom and honey, making the yogurt taste like the Indian shrikhand. The crust is entirely raw – made of almond, coconut flakes and hemp seeds. This healthy dessert is easy to make and can be stored in freezer for 10 to 15 days. Hope you enjoy! 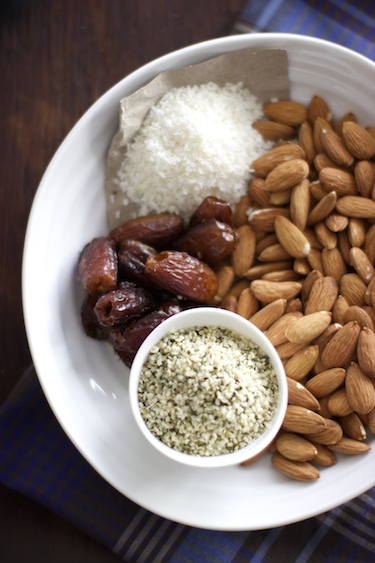 Place almonds, dates, coconut flakes, hemp seeds, sea salt and coconut oil in food processor. Pulse until chopped, to chunky/sticky mixture. (Add couple of tbsp of cold water if needed). Place mixture in springform pan, you can also use regular cake pan covered with saran wrap. Flatten out with your fingers or back of a spoon. Cool in the fridge for 30 minutes. Put drained yogurt, cardamom, honey, lemon juice and salt in the food processor. Mix well and adjust for sweetness. Pour the yogurt mixture over the crust and tap the pan gently on the counter to release any air bubbles. Put the pan in the freezer for at least 30 minutes to set. Before serving, take the pan out of the freezer and thaw for 15 minutes. 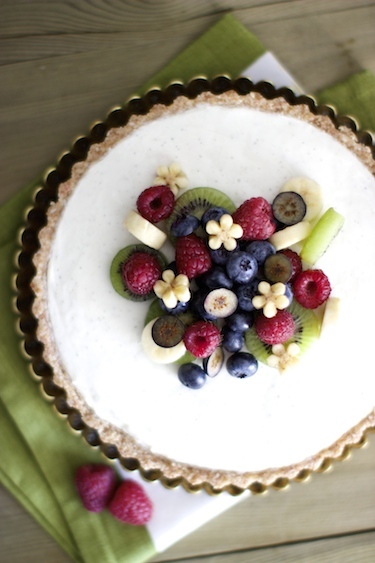 Top the tart with your choice of fresh fruit or berries before serving. Thank you Kendra! I think you could use strained greek yogurt as a substitute for cream cheese. Now you are giving me ideas! You are such a creative chef! This dish looks great. Shrikhand with tart must be delicious. I love the flavor of cardamom. I cant wait to try out this lovely dessert! Thanks Lopa! I bet Nikhil would love this one, and its really simple to make. Perfect for busy folks like you! oh my goodness. MUST MAKE. Hey Gal! We think alike! I say the same thing! Blank canvas and adding your own colours to it… read this two post of mine, we echo the same words! Virtual Hi-Fi! Read your post, and yes, we do think alike! Cooking can only be fun if you have fun with cooking! So beautiful! Are those banana flowers on top? Thanks Lisa! Yes, those are banana flowers. What a gorgeous tart and filling it with shrikhand is an awesome idea! Wow – not only is this beautiful, but it looks delicious! I love the little flowers you made out of, are those bananas? Whatever they are, super gorgeous! Thanks Mallory, yes those are banana flowers! You have a real gift for cooking! I love your pictures and the food looks so amazing. 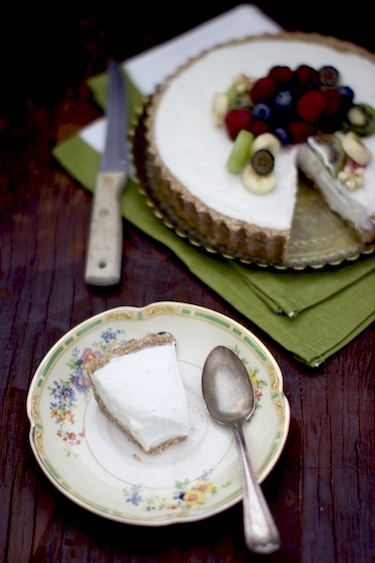 great ideas here – the greek yogurt filling – I love shrikhand, and love your almond meal crust. Suddenly dessert seems accessible. I have to try this! You are so creative to make those banana flowers…. 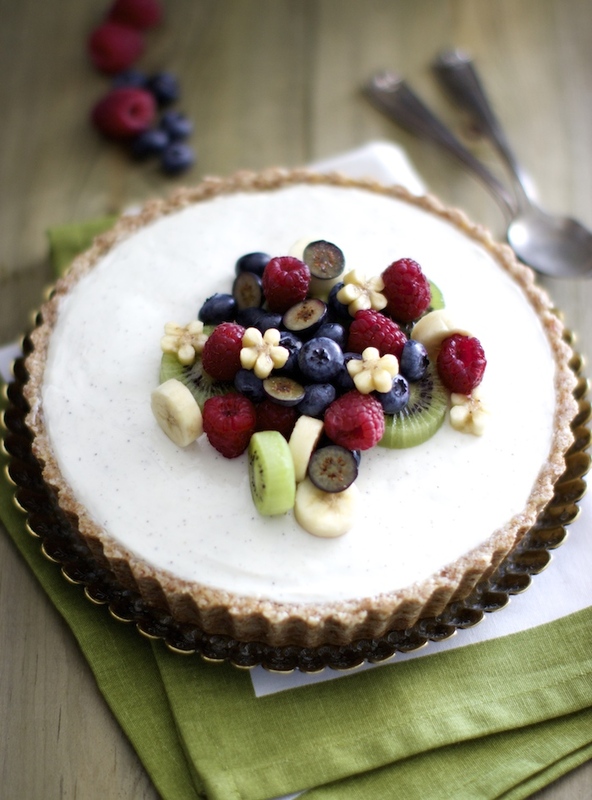 What an amazing looking tart, Medha! Your dishes are always beyond gorgeous – truly like art. Love how you combine your classic french training and your cultural heritage in this recipe. Coconut yogurt would be a nice substitution for our Vegan friends! 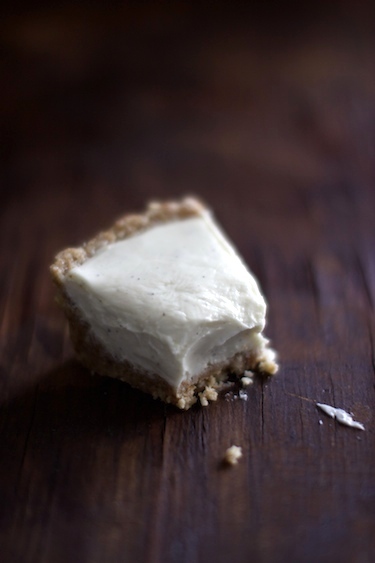 I can’t take my eyes off this tart, and that crust sounds so unusual, I’m looking forward to making it! Beautiful! need your professional advice: how about adding a pinch of cinnamon in the filling? Will that go well? Thanks! Hey Maya, thank you! Yes, cinnamon and cardamom pair very well together. Even nutmeg, vanilla and saffron pair well with cardamom too. I would use one or two spices at a time so they don’t overpower each other! This is beautiful!!! 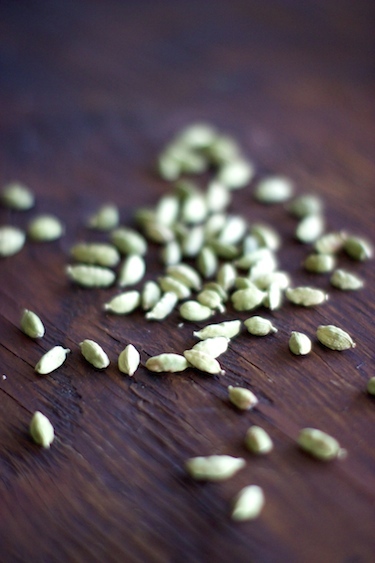 I’m so hooked on cardamom that I want to use it everything these days… putting it in a yogurt tart sounds just divine. Love this. Thank you Crystal, and please do let me know how the tart turns out! Would it be very wrong if the tart would be out of the freezer for an hour? The tart will be okay out of the freezer for an hour. The filling will be softer though, making the tart harder to slice. What I recommend is that you slice the tart when its frozen, and then leave it outside. And what does even hold the fill together? Only low temperature? The coconut oil in the crust will hold ingredients together. On low temperature the coconut oil will freeze holding the crust in shape.